Not really news, as we had seen these at events prior, but we're intrigued, and as Lenovo's not really much of a big player in Canada, we got some details that we can share finally. First up is the Yoga Tablet 2 Pro. Yeah, this is the one with a projector built in! Also, as with other Yoga tablets it has the little 'lip' part that flips around to act as the stand. This time around they've put a little hole in it, which will act as a 'hanger' for the device if you want to leave it on a wall or something. Kinda neat. They're listing this out at $550. Which seems a little pricey if you look at the tablet specs alone, but having the ability to broadcast your screen up to a 50" is pretty neat and brings some unique value add. I just think it'd be a little awkward to turn it sideways to do so. 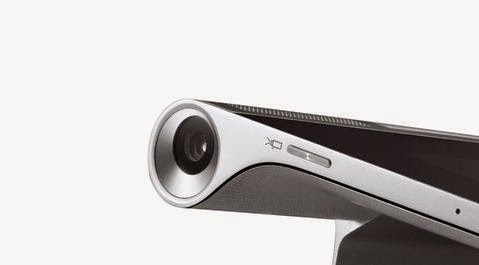 The Yoga Tablet 2 is lacking the projector that the other does and comes in both Android or Windows flavours. We'll just look at the Android; which comes in an 8" size as well as a 10" size. Not bad specs, and the prices are better at $299 and $349.